The dimpled, irregular skin appearance known as "cellulite" can prove frustrating for patients who work hard to achieve a slim, smooth body. Thanks to recent technological breakthroughs, cosmetic surgeons can now offer long-term reduction in cellulite through minimally invasive treatments. Cosmetic surgeons use a variety of treatments to help patients reduce cellulite. While none are permanent, many can achieve results that last a year or longer. Below, we’ve outlined the most commonly used treatment types and brand name applications—availability of these or any other treatment will vary depending on what cosmetic surgeons in your area offer. Cellfina is an FDA cleared automated mechanical cellulite reduction treatment. It works by releasing tightened septae using a very thin blade, which is inserted through a tiny incision. The skin is gently suctioned up into the Cellfina device, which allows the cosmetic surgeon to insert the blade only a few millimeters beneath the skin, minimizing impact on surrounding tissues. Local anesthesia is used. Most patients who are bothered by cellulite have tried cream or lotion that promises to improve cellulite. While certain medical grade products can help gradually improve collagen production for firmer skin, even high-quality products are rarely effective on cellulite, which requires more extensive remodeling of fat, connective tissue and collagen than a cream can provide. Cellulite creams are rarely a worthwhile investment. 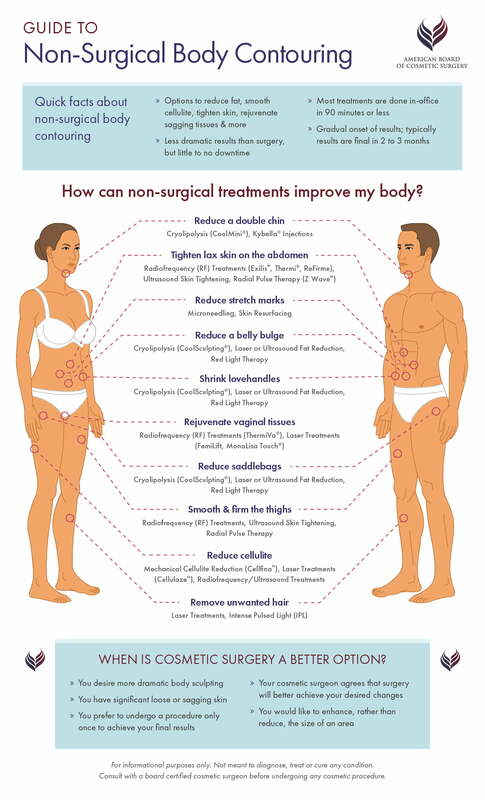 Non-surgical body contouring includes much more than cellulite reduction. Today, you have options to reduce fat, rejuvenate vaginal tissues, tighten skin, and remove unwanted hair. The guide below outlines your options.